TALLAHASSEE — The Florida Department of Environmental Protection announced Sunday that 70 state parks that had been closed because of Hurricane Matthew have reopened. Twenty-five others between St. Lucie and Nassau counties remain closed. The list includes the Fort Pierce Inlet State Park and Sebastian Inlet State Park in Indian River and Brevard counties. The state did not provide a timeframe for reopening the 25 closed parks but said teams of workers from unaffected parts of the state have been sent to assess damages and begin cleanup and repairs. WEST PALM BEACH — The Florida Fish and Wildlife Conservation Commission on Wednesday ordered the J.W. Corbett and Allapattah Flats Wildlife Management Areas, and the John C. and Mariana Jones/Hungryland and DuPuis Wildlife and Environmental Areas closed because of the approach of Hurricane Matthew. The areas will remain closed until further notice. The closure applies to all vehicles and public access. The three sites are in Palm Beach and Martin counties. TALLAHASSEE — This summer, Florida divers did a number on the state's lionfish population, removing 16,609 of the finned invaders through a program called the Lionfish Challenge. A total of 95 people participated in the state-sponsored challenge, which began in mid-May and ran through Sept. 30. Lionfish are natives of Indian and Pacific oceans but the population has spread to the Atlantic and Mediterrainean in recent years. They were first documented in Florida in the 1980s and are now found off both the Atlantic and Gulf coasts. They are aggressive fish and pose a threat to reef ecology, and the only way to control their population is through human hunting. Hence the Lionfish Challenge. “The success of this program really shows what Florida’s residents and visitors can do when faced with a conservation challenge such as lionfish,” Florida Fish and Wildlife Conservation Commission Chairman Brian Yablonski said. Challenge participants who caught 50 or more lionfish received program t-shirts, commemorative coins, the opportunity to take an additional spiny lobster per day during the two-day sport season and entry into raffle drawings. Volusia County resident David Garrett took the most lionfish with a total of 3,324. John Dickinson came in second with a total of 2,408 lionfish removed. Garrett will be officially crowned Lionfish King at the Nov. 16 Commission meeting in St. Petersburg. He will also receive a lifetime saltwater fishing license and be featured on the cover of the January 2017 Saltwater Regulations Publication. KEY LARGO — Three Burmese python hatchlings have been found on Key Largo for the first time, and state and federal officials have issued a BOLO of sorts to residents of the island. Burmese pythons have been seen in the Keys previously, but these are the first hatchlings spotted. The Florida Fish and Wildlife Conservation Commission and the U.S. Geological Survey have sent out postcards to Key Largo resident asking for their help in finding the snakes. The postcard shows a picture of a python and a phone number to call if one is spotted. One 18-inch-long Burmese python was found on August. 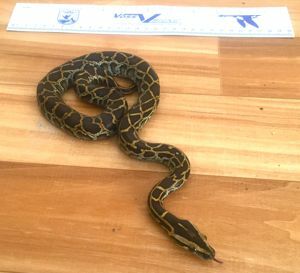 2 in Key Largo, and a second similar-sized python was found on the next day in the same area.. A third hatchling was found on Aug. 23 in north Key Largo. These observations have been confirmed, and suggest that pythons have reproduced nearby, but there have been no sightings of python nests or eggs in the area. “While we have documented Burmese pythons in the Keys for a while now, this is the first time we have documentation of hatchlings in the area. This is not surprising considering the proximity to the known breeding population in the Everglades,” said Kristen Sommers, section leader of the FWC’s Wildlife Impact Management Section. Wildlife officials say the information that they receive from the public will help agencies in their research and control efforts and reduce further spread of the snakes. The Keys are of special concern because of the presence of small mammals that are already threatened and would be easy prey for Burmese pythons. Residents and visitors can help by reporting sightings of Burmese pythons and other nonnative species to the FWC’s Exotic Species Reporting Hotline at 888-Ive-Got1 (888-483-4681), online at IveGot1.org or by downloading the free “IveGot1” smartphone app. WEST PALM BEACH — The Florida Fish and Wildlife Conservation Commission has temporarily closed several activities and roads in the Everglades Wildlife Management Area until further notice because of the effects of recent storms. Fishing and some other specified activities will remain open. Public access to the interior of the WMA is prohibited, except Conservation Area 2A from the L-35B levee north to the east-west airboat trail, and Conservation Area 3A South, east of the Miami Canal between I-75 and the L-67A levee. The closure applies to vehicles, airboats, all-terrain vehicles and any other public access, and will remain in effect until further notice to ensure public safety and resource conservation. These closures do not apply to those permitted to participate in the statewide alligator hunts, migratory bird hunts, frogging, fishing, or people operating boats within the established canal systems. Access for these activities is limited to vessels only, and participants must maintain a minimum distance of 100 yards from any tree island to minimize disturbance to wildlife. Use of airboats or tracked vehicles is not permitted for these activities. Environmental Change: Do Science and Policy Collide? featuring sea level rise expert John Englander on Sept. 22 at 5:30 p.m. at the Summit Boulevard Library, 3650 Summit Blvd, in West Palm Beach. Issues of climate change, energy, sea level rise, recycling, the Everglades, fresh water, ecosystem, algae, and others might appear similar. Englander, during a 40-minute presentation will explain where these issues overlap and where they are quite different in terms of the science and policy. The presentation will be followed by an audience Q&A session. Click to RSVP by email. DELRAY BEACH — The City of Delray Beach and the Sandoway Discovery Center are inviting the public to participate in in the Ocean Conservancy's International Coastal Cleanup set for Sept. 17. The program, which is coordinated by Keep Palm Beach County Beautiful. in Palm Beach County will remove trash and debris from Delray's municipal beach. This year's cleanup will begin at 8 a.m. at the Sandoway Discovery Center, 142 South Ocean Boulevard. Residents and visitors are encouraged to participate; supplies will be provided and students may earn community service hours. A volunteer registration form is available here, or e at the Sandoway Discovery Center; Delray Beach City Hall, 100 NW 1st Avenue; and the Delray Beach Community Center, 50 NW 1st Avenue. WASHINGTON – The White House this week launched the second year of its Every Kid in Park program, which gives fourth graders and their families free access to federal lands for a year. The program includes all national parks, national forests, wildlife refuges and marine sanctuaries. The pass becomes effective Sept. 1 and runs through August 31, 2017 and allows the student and allows the student and three accompanying adults fee-free access. An entire carload (noncommercial) of passengers are also covered for drive-in parks. Fourth graders can log onto the Every Kid website at www.everykidinapark.gov and complete an educational activity to get and print their pass. Students can also trade in their paper pass for a more durable pass at participating federal sites nationwide. The Every Kid in a Park program is an Administration-wide effort between the Department of the Interior, the Department of Agriculture, the Department of the Army, the National Oceanic and Atmospheric Administration and the Department of Education. TALLAHASSEE — By a comfortable margin, Florida voters Tuesday elected to remove a barrier blocking the Sunshine State's solar development. Voters approved a constitutional amendment that exempts solar energy systems from both tangible property taxes and real estate taxes. The measure received about 1.7 million votes or about 70 percent of the total statewide. The measure received bipartisan support in the Legislature, led by State Sen. Jeff Brandes, R-St. Petersburg and Reps. Lori Berman, D-Boynton Beach and Ray Rodrigues, R-Fort Myers. The measure, on the ballot as Amendment 4, had endorsement of more than 200 organizations, businesses, elected officials and government bodies. "We are thrilled that voters embraced this important amendment, which will lower energy costs and create new jobs and business opportunities for solar power in the Sunshine State," said Tory Perfetti, chairman of Floridians 4 Lower Energy Costs. Voters will have a second proposed amendment on the November ballot. Critics say it will cause owners of roof-top solar units to pay significantlyhigher utility bills. Wild South Florida is looking for news, big and small. Is your organization holding a special event or program? Have you hired new employees, or promoted someone on your staff? Send us a news release with a contact name and number via email and we'll included it on our pages. Photographs are welcome too. Questions? Email us, or call 561 450-8258.